TORONTO (Apr. 14) — The white noise that Auston Matthews is probably trying to ignore could become deafening in the very near future. It is still too soon to burden the young Toronto Maple Leafs star with a label, but it won’t be long before he warrants the most–unsavory tag in professional sport — an inability to perform in the clutch. It is now nine playoff games, dating to last spring, in which Matthews has been dead–silent against the Boston Bruins. And though I’m not–yet prepared to abandon my prediction of Toronto winning this year’s opening round in six, the forecast was largely predicated on No. 34 enacting an important role. Without Auston’s stick, the Maple Leafs haven’t a prayer of knocking off the Bruins. Nor can I adequately explain why the club’s most–domineering forward has withered in the post–season. His combination of gifts — speed, size, willingness to crowd the net and a blistering shot — is tailor–made for this time of year. But, even when the Leafs played “catch me if you can” in the series opener on Thursday (winning 4–1), Matthews was barely noticeable. With Nazem Kadri likely unavailable for the remainder of the Division semifinal — as a repeat playoff offender, he’ll be dealt with harshly in a league hearing on Monday for his crosscheck to the head of Jake DeBrusk — it is doubly important for Matthews to find his scoring touch. And, to begin justifying, when it truly matters, the multi–millions about to line his pocket. Celebrated careers in sport are made in the playoffs, not the regular season. Matthews has proven capable, if healthy, of scoring 50–60 goals over 82 games between October and April; of giving fans bang for their buck. Neither of which will be of any consequence if he continues to come up lame in the post–season. There is nothing complex or abstract about it. Auston needs to ramp up his energy and emotional pitch. Big time. Otherwise, he’s just another player. And, what a profound waste that would be for the Blue and White. GOING EASY ON NAZ: Though I’m surely amid the overwhelming minority, I don’t feel particularly mortified about Nazem Kadri’s behavioral pattern in the playoffs. That opinion, of course, won’t stop the National Hockey League from suspending the Toronto center–man four–to–six games for going postal yet again at the TD Garden. Nor do I condone cross–checking an opponent in the head. 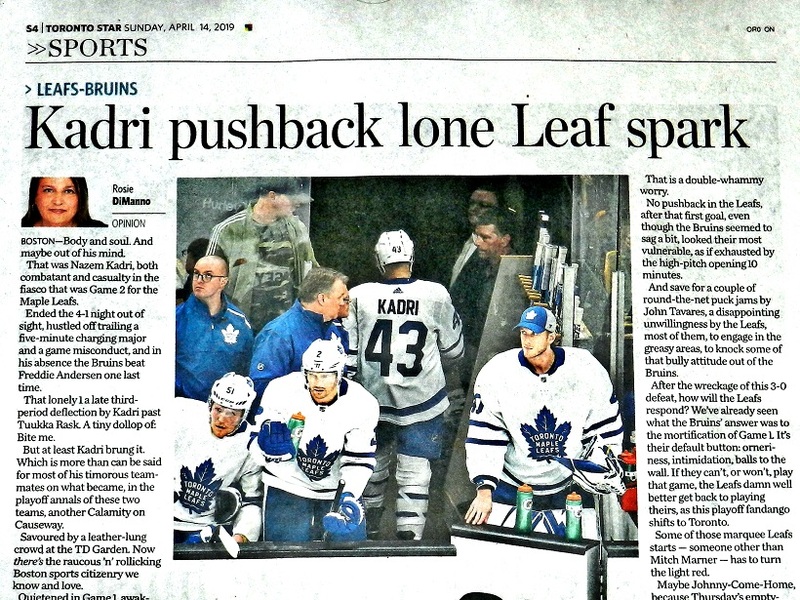 But, I think I can understand the impetus behind such repetitive conduct: Kadri knows that he’s all alone. On an island among his fellow Leaf forwards — none of which have the slightest desire or inclination to push back when the Bruins begin to flex. It happened last year and it happened again on Saturday night, when Boston wisely chose to avoid getting involved in a track meet for a second consecutive game. The Bruins have no hope of out–racing the Leafs, but they can out–muscle the passive Toronto forwards. By a country mile. 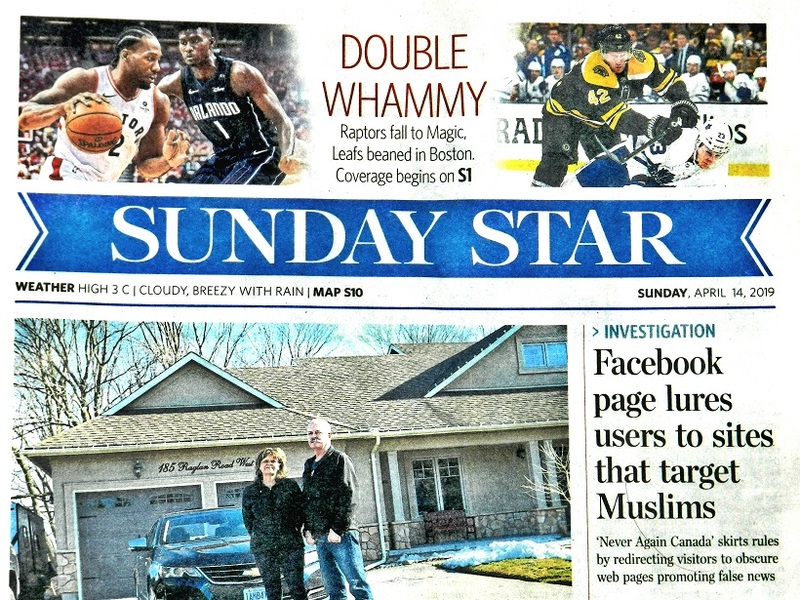 When that inevitably occurs, Kadri becomes the lone wolf. Only he shows any compunction to push back. How frustrating it must be to watch those around him capitulate at the first sign of hostility. So, yeah, he goes above and beyond what he’s capable of at his diminutive size. Were there even one teammate willing to ride shotgun with him, perhaps Nazem’s self–control would prevail. As of now, we don’t know which blueprint will reign in this series. Each team has been thoroughly dominant — the Leafs with their quickness and puck–movement in Game 1; the Bruins with their vaunted sandpaper in Game 2. If the latter wins out, it will be a clear, unquestioned sign that the Leafs must begin to alter their style, personnel and prototype in the off season. But, let’s see how the remainder of the series unfolds. HOME COOKING? Perhaps the Leafs are not brawny enough to avail themselves of home ice. How else can one explain such a talented club losing 16 times in regulation at Scotiabank Arena during the regular schedule? If, however, there is some latent punch in the line–up, it will flourish in Games 3 and 4 of the Boston series. Remember, the Leafs have already accomplished what was mandatory — winning a match at the TD Garden. The Bruins’ triumph in Game 2 reduced this playoff round to a best–of–five; Toronto with the theoretical home–ice advantage. If the Leafs can prevail in their three scheduled encounters on Bay St., Boston will be eliminated. But, decades of underachievement at Maple Leaf Gardens and the Air Canada Centre/Scotiabank Arena follow the Maple Leafs into Game 3 on Monday night. For whatever reason, the franchise has traditionally cowered before its partisan audience. Maybe this year will be different. Perhaps Mike Babcock, frenetically matching lines, will engender more ice room for his nimble forwards and the Bruins will be chasing, as in Game 1. Or, Boston will use its playoff savvy to bottle up the home side in the neutral zone, where tempo accelerates. Incredibly, the Maple Leafs have never won Games 3 and 4 at home after splitting the first two matches on the road in a best–of–seven series. Not once. Is there a first on the horizon this week? OY VEY, TAMPA BAY: If the Columbus Blue Jackets go on to eliminate the 62–win Tampa Bay Lightning in the opening round, it will be the biggest upset in Stanley Cup history — rivaled only by Montreal knocking off Boston in the 1971 quarterfinals. That was the year rookie Ken Dryden bolted up the Canadiens’ goal after Bobby Orr, Phil Esposito and Co. had destroyed a bushel–full of NHL records, including 57 wins, 121 points and 399 goals scored during the regular schedule. The Bruins were 24 points superior to the Habs in 1970–71 and pored in 108 more goals. But, Dryden pulled off miracle after miracle in stymieing the lethal opposition and Montreal won the series in Game 7 at Boston Garden. Tampa Bay finished 30 points ahead of Columbus this season. Only the 1995–96 Detroit Red Wings won as many games as the Lightning. 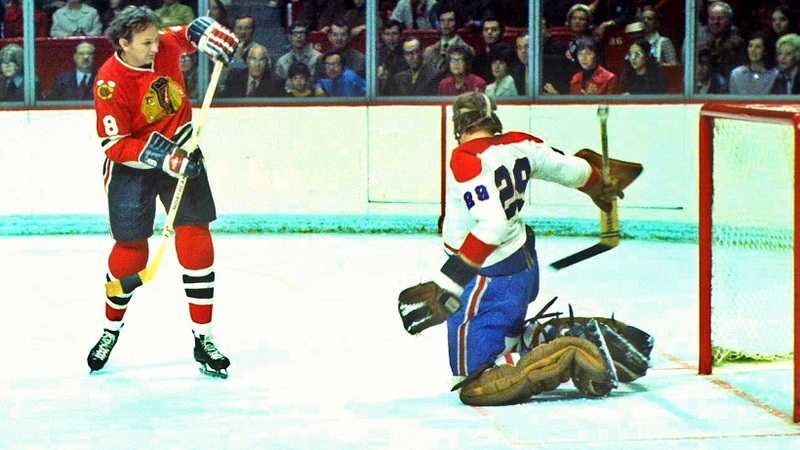 ROOKIE KEN DRYDEN WAS BRILLIANT FOR MONTREAL IN THE 1971 PLAYOFFS, ULTIMATELY LEADING HIS CLUB TO VICTORY OVER JIM PAPPIN AND CHICAGO IN THE STANLEY CUP FINAL. That was a good one. Another was Arturs Irbe of San Jose beating the #1 Red Wings in 94. Hey babe. Howcum only you and I seem to get this, about Kadri? What a buncha pussies on the beat. Another playoff upset that springs to mind, albeit in the second round, and one that featured another team viewed as an overwhelming favourite to claim the Cup, was when the Islanders knocked off the two-time defending champion and President’s trophy winning Penguins in the spring of 1993. In addition to a 32 point regular season gap between the two teams, the Islanders pulled off the upset without the services of Pierre Turgeon, who had finished the season tied for fifth in NHL points and piled up 45 more points than his next closest teammate.